Budweiser Super Late Model (50 laps) 1 09 Justin Drake, Burnham; 2 72 Scott Robbins, Dixfield; 3 12 Derek Griffith, Hudson, NH; 4 61 TJ Brackett, Buckfield; 5 36 Ryan Robbins, Dixfield; 6 29 Austin Teras, Gray; 7 94 Shawn Martin, Turner; 8 01 Andy Saunders, Ellsworth; 9 47 Gabe Brown, Center Conway, NH; 10 9 Alan Tardiff, Lyman; 11 60 Tim Brackett, Buckfield; 12 54 Ryan Deane, Winterport; 13 46 Dennis Spencer, Oxford; 14 78 Ivan Kaffel, Raymond; 15 8 Calvin Rose, Jr., Turner; 16 25 Shawn Knight, South Paris; 17 03 Scott Moore, Anson. 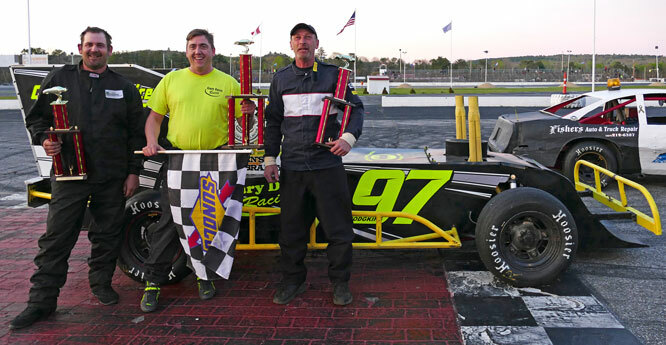 Oxford, Maine -- Burnham�s Justin Drake earned his first Oxford Plains Speedway race victory of the season Saturday night. 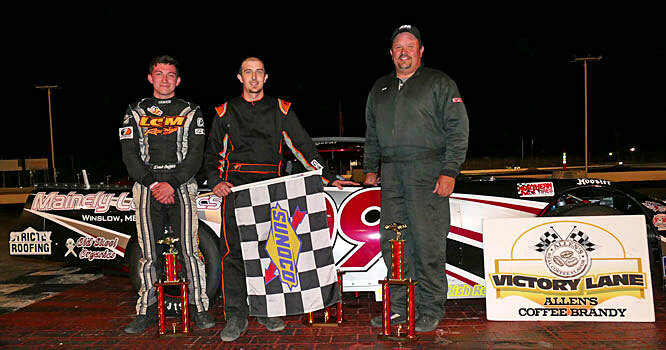 Drake outran a quality field of Super Late Models in the 50-lap main event, topping the Budweiser Championship Series racing card at the historic Route 26 oval track for the third time in his career. Drake swapped the early race lead with Ellsworth's Andy Saunders, then held off challenges from Scott Robbins and Derek Griffith to post the win. Robbins, of Dixfield, again impressed using the entire racing surface in his drive through traffic into the runner-up position, where he finished. Griffith, a two-time winner so far this year in Pro All Stars Series Super Late Model competition, claimed his second third-place finish in his second 50-lap Budweiser Championship Series appearance of the season. TJ Brackett of Buckfield, the previous week's Super Late Model winner, was fourth under the checkered flag. Dixfield's Ryan Robbins earned a fifth-place finish after starting the race in 15th spot. Rookie Austin Teras of Gray was sixth, followed by Shawn Martin of Turner, Saunders, Gabe Brown of Center Conway, New Hampshire and defending OPS Super Late Model champion Alan Tardiff of Lyman. 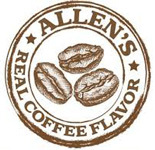 Matt Dufault of Turner prevailed in a non-stop 30-lap main event for the Allen's Coffee Flavored Brandy division. 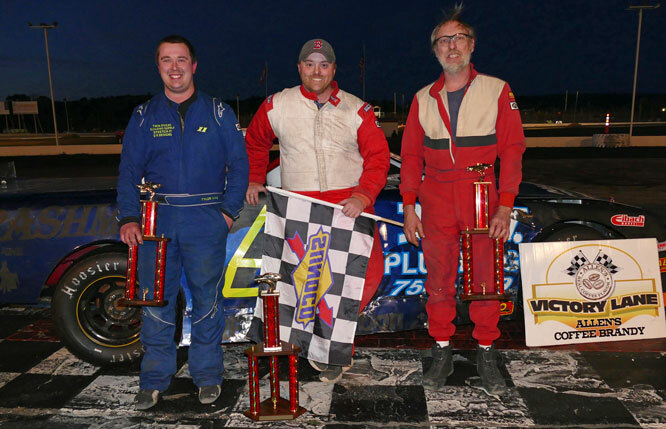 It was the first victory of the season for Dufault, wheeling a wicked-quick antique Camaro racecar owned by Rodney Williams. Norway's Mark Turner was dialed in, with an outstanding drive netting him a second-place trophy. Tyler King of Gray, already a two-time winner this season, filled the final step on the podium. Greene's Andrew Breton led the first half-dozen laps of the race and ended up in fourth place. Tyson Jordan of Oxford was fifth in his first appearance of the season. Former champion Jamie Heath of Waterford raced to his first victory of the season, padding his lead in the championship points standings in the four-cylinder Bandits class. Heath battled Rob Crepeau of Minot for the race lead, then maintained an advantage on the track for the balance of the 20-lapper. Dustin Salley of Poland, the previous week's winner, prevailed in a late battle for runner-up honors with Crepeau, who finished up in third position. Cam Childs of Leeds andf Oxford's Chad Wills rounded out the top five. Eric Hodgkins of Minot nailed down his second consecutive victory in the 20-lap Figure 8 race. Hodgkins chased down and passed early race leader Dale Lawrence of Lisbon and went on to victory lane, claiming the championship points lead in the process. Lawrence hung on to claim runner-up honors, ahead of opening day winner Kyle Kilgore of South Paris. Poland's Larry Lizotte managed a fourth-place finish, ahead of local Figure 8 racing legend David Smith of South Paris. Thomas Brackett of Oxford outran Brady Heath of Waterford in a 15-lap race for the new Rookie division. 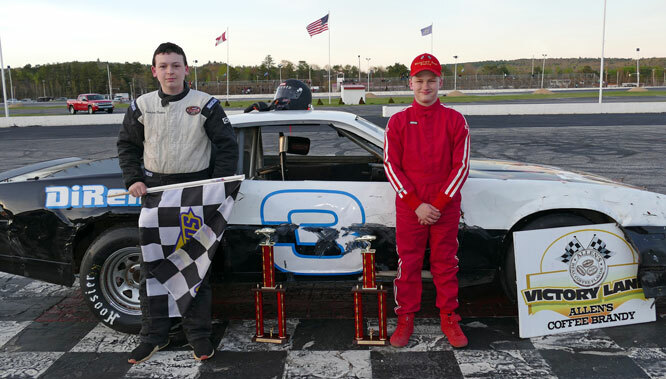 There is a big doubleheader weekend coming up May 19-20 at Oxford Plains Speedway, with the weekly Budweiser Championship Series racing program scheduled for Saturday night at 7:00 p.m., with a 30-lap Super Late Model race highlighting that night's action. Sunday, May 20 finds a special touring series tripleheader, featuring a pair of 150-lap races for the Pro All Stars Series Super Late Models, plus the American-Canadian Tour Late Models. PASS Mods will round out that show, with post time set for 2:00 p.m. For more information visit oxfordplains.com or call (207) 539-8865. Allen's Coffee Flavored Brandy Street Stock (30 laps) 1 61 Matt Dufault, Turner; 2 09 Mark Turner, Norway; 3 11 Tyler King, Gray; 4 33 Andrew Breton, Greene; 5 14 Tyson Jordan, Oxford; 6 36 Rick Spaulding, Lisbon; 7 4 Jordan Russell, Norway; 8 74 Rick Thompson, Naples; 9 56 Addie McDaniel, Bridgton; 10 62 Skip Stanley, Oxford; 11 12 John White, Auburn; 12 52 Mike Nichols, Livermore Falls. Bandits (20 laps) 1 91 Jamie Heath, Waterford; 2 18 Dustin Salley, Poland; 3 77 Rob Crepeau, Minot; 4 11 Cam Childs, Leeds; 5 52 Chad Wills, Oxford; 6 71 Chris Foster, Lisbon; 7 2 Shaun Hinkley, Oxford; 8 1 Brandon Varney, Mechanic Falls; 9 08 Mike McKinney, Berlin, NH; 10 24 Travis Verrill, South Paris; 11 6 Cody White, South Paris; 12 2x Butch Keene, Turner; 13 44 Jeffrey Libby, Auburn; 14 4 Tyler Libby, Auburn; 15 8 Jeremy Lauzier, Rumford; 16 3 Chachy Hall, Oxford; 17 12 Adam Sanborn, West Paris. Figure 8 (20 laps) 1 97 Eric Hodgkins, Minot; 2 2 Dale Lawrence, Lisbon; 3 4 Kyle Kilgore, South Paris; 4 00 Larry Lizotte, Poland; 5 54 David Smith, South Paris; 6 41 Greg Durgin, South Paris. Rookie (15 laps) 1 3 Thomas Brackett, Oxford; 2 91 Brady Heath, Waterford.